The streamline moderne cars of the art deco period are a far cry from most of the mundane models of today. 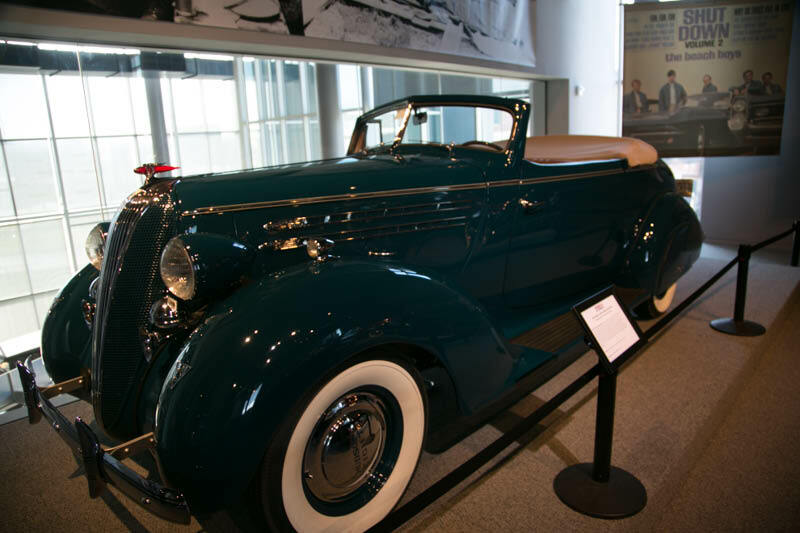 From slanted grills and swooping fenders to sleek speed lines and shimmering colors, the streamline moderne cars of the Art Deco period are a far cry from most of the mundane models of today. 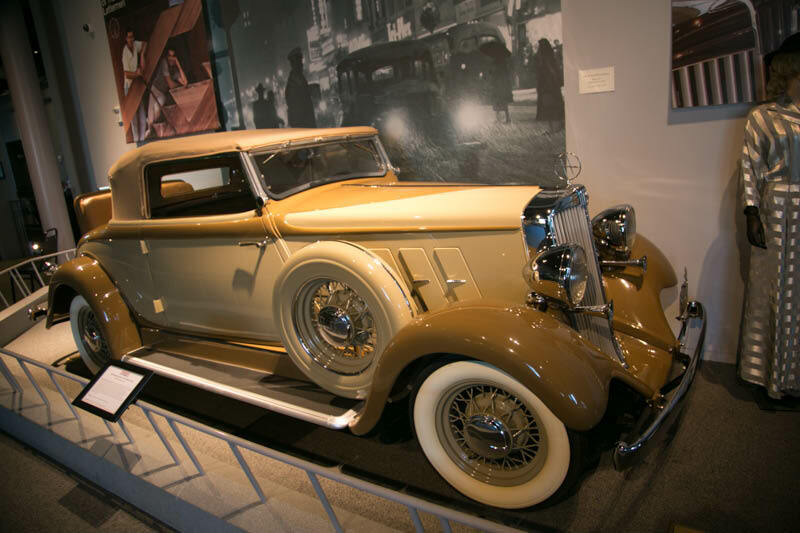 At America on Wheels' new exhibit, "The Harmony of Form & Function," these stylish vehicles are celebrated in a display of 13 vehicles, ranging in age from a 1925 Rickenbacker D6 brougham to a 1941 Chrysler Newport. Highlights of the exhibit, which opened Friday and continues through May, include a cream 1934 DeSoto Airflow coupe, developed in a wind tunnel with the assistance of aviation pioneer Orville Wright; a turquoise 1936 Hudson Custom Eight convertible, featuring a double-glass V-shaped windshield; and green 1939 Graham Model 97 "Sharknose," featuring an unusual forward-facing grill. 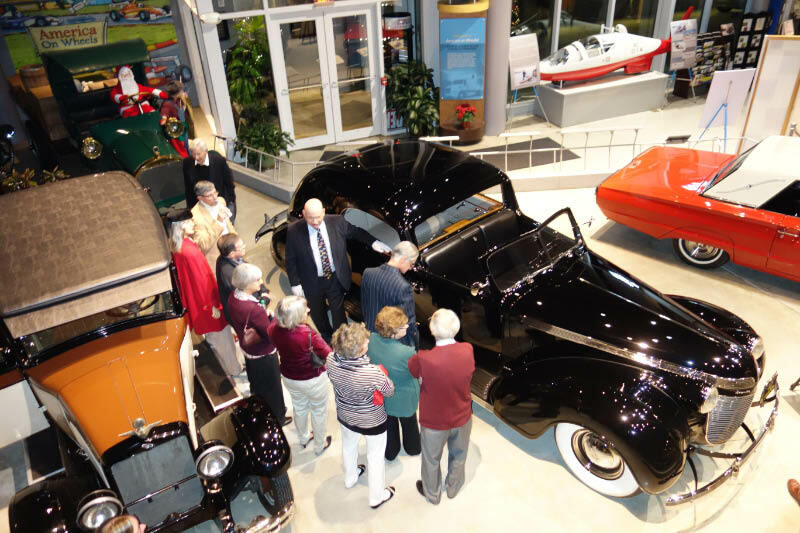 The main attraction is a black 1937 Chrysler Imperial C15 town car, custom built by LeBaron and personally ordered by Walter P. Chrysler as a gift to his wife, Della. 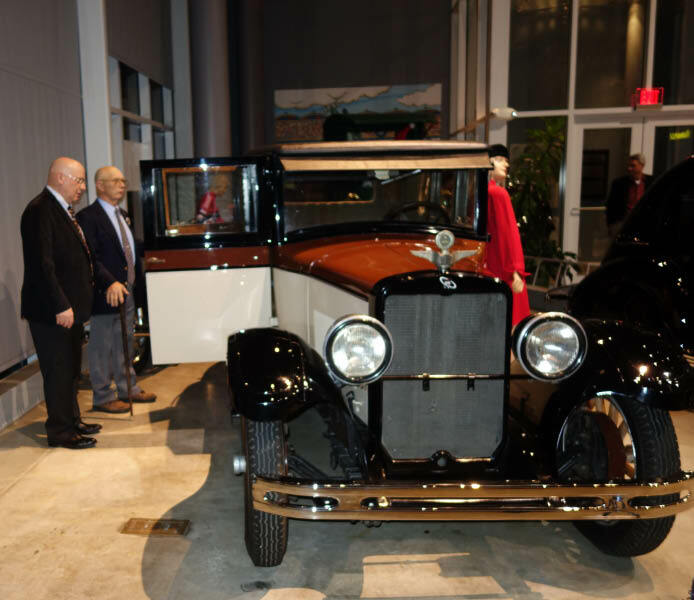 The seven-passenger limousine, featuring a luxurious leather interior, can be found in the museum's lobby while the other vehicles are housed in the second-floor gallery. 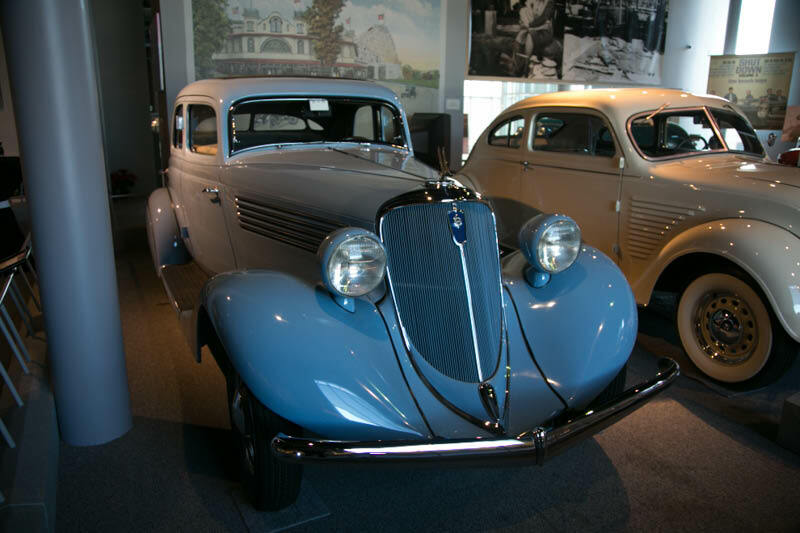 "Unlike the cars of today, they weren't just about simple transportation; they were about making bold statements and high style," says Linda Merkel, executive director of the museum. Art Deco, the predominant decorative style of the 1920s and 1930s, is characterized by bold colors and angular geometric shapes focusing on upward movement, says Alan Gross, chairman of the museum's exhibit committee. Streamline Moderne, which arose from Art Deco in the early 1930s, encompasses more curved and organic design elements. 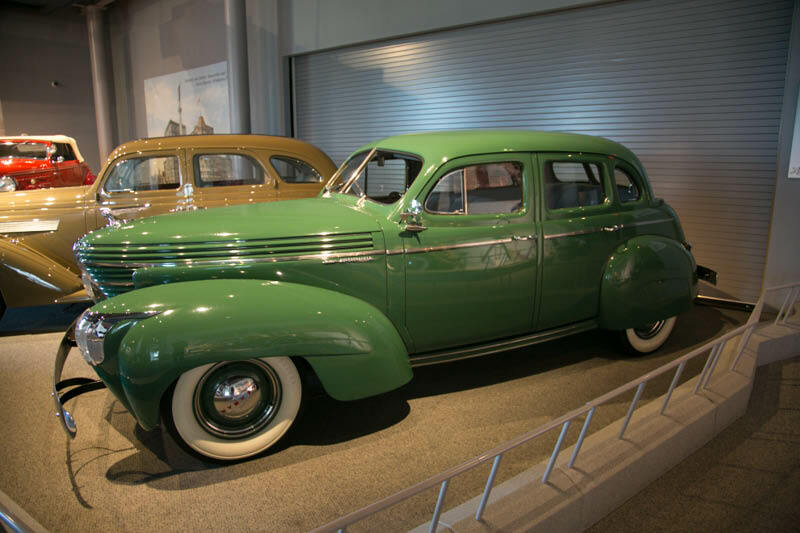 All of the vehicles have aspects of both, but are predominantly Streamline Moderne. Common features include long, two-toned hoods, glistening speed lines on the sides and dramatically arched fenders and roofs, which make the cars look like they are moving when they're standing still. "Prior to 1933, it was mostly about function with design being secondary," Gross says. "After 1933, designs were emphasized and incorporated much more. Engineers actually worked with the designers when building new models." 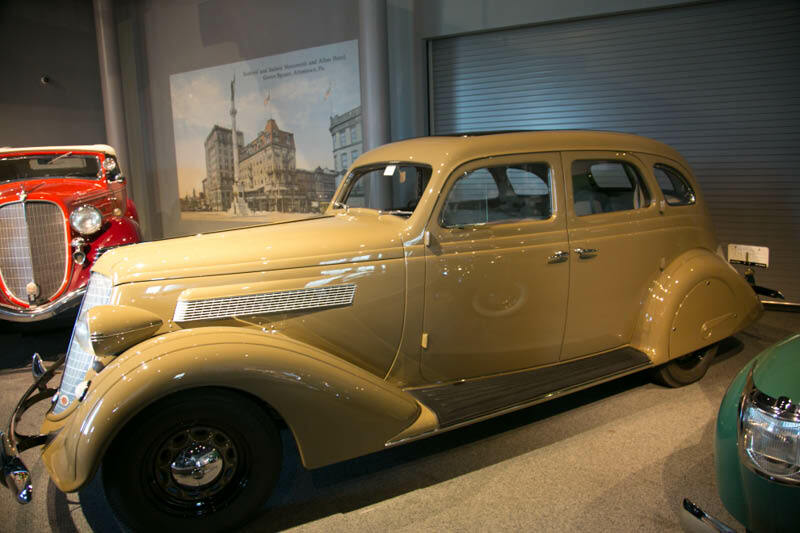 The chauffeur-driven Imperial, which has become known as "Mrs. Chrysler's Chrysler," features a rounded rear passenger compartment with speed lines, curved tire skirts and a running board. 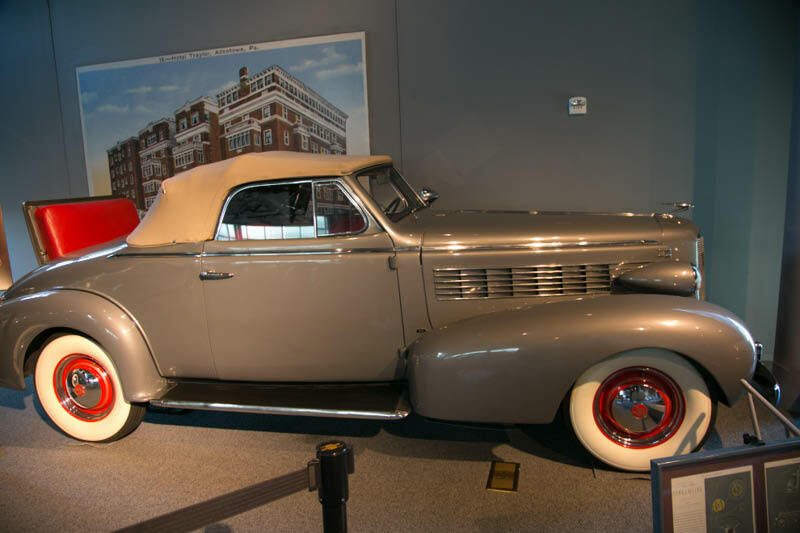 Owned by Howard and Rosalind Kroplick of East Hills, N.Y., the 19-foot-long vehicle is believed to be the first automobile built with spring-loaded power windows and door locks. It features a straight 8-cylinder in-line engine, 144-inch wheel base and a lavish interior — complete with a handmade wooden vanity containing a bar, clock and section for toiletries. It has won many awards at the most prestigious concours in the world, including Pebble Beach and Amelia Island. "Money was no object, so the entire vehicle is unbelievably opulent," Gross says. The Chrysler founder always was more concerned with engineering than design and because of that, Gross says, he miscalculated the public's tastes a few years earlier. With the DeSoto Airflow, the public largely rejected the car's "homely body style," despite its integral headlights, waterfall grill and other streamline features, says Gross, noting the stubby front portion is reminiscent of a Volkswagen Beetle. 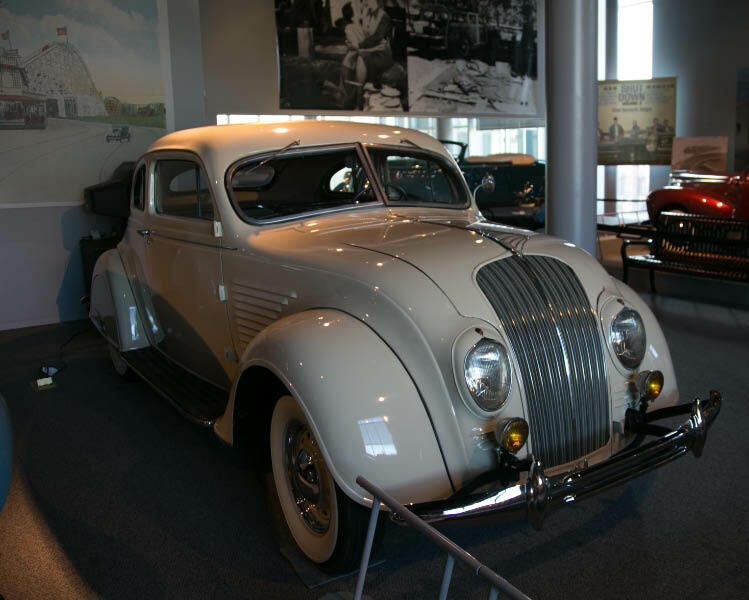 The car, designed by three prominent Chrysler engineers known as "The Three Musketeers," was a commercial failure, and sold only 56,000 over its three-year run. Still, it is the most significant of the bunch from an engineering perspective, Gross says, as it led to many future standard features. First, it was one of the first cars to feature an all-steel body, making it safer than older cars, which typically had some wooden framework. Second, it boasted bolt-on fenders, making it a partial-unibody vehicle and easier to handle. And third, the engine and passenger compartment were moved forward, allowing for about 50 percent of its weight to be on the front axle and about 50 percent on the back, making it perform and handle better. Previously, most cars had 35 percent of their weight on the front and 65 percent on the back. "The key here is that the bodies were designed by engineers and there wasn't a separate design department, which led to the concept falling flat with consumers," Gross says. "From an engineering standpoint, it's absolutely outstanding and ahead of its time. From an aesthetic standpoint, it leaves a lot to be desired." 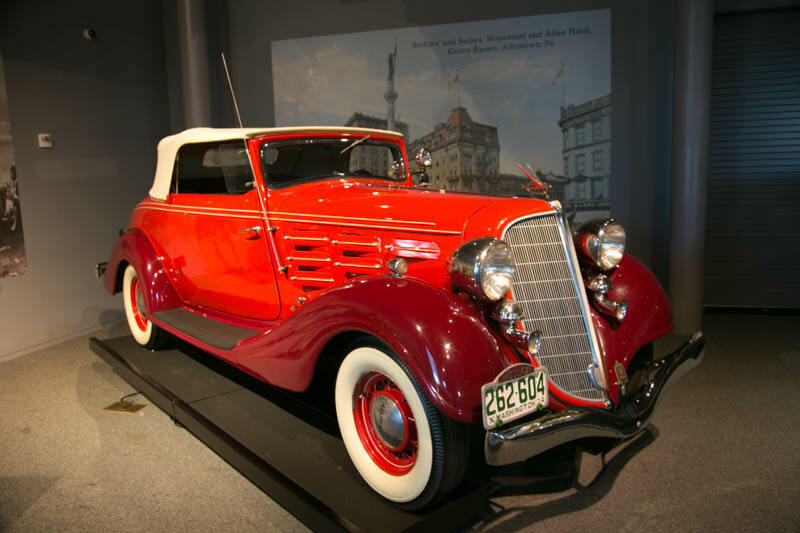 Among Gross' favorite vehicles are the Chrysler Newport, a tan 1933 Hupmobile K-231 convertible coupe and a Red 1940 Lincoln Zephyr V12. 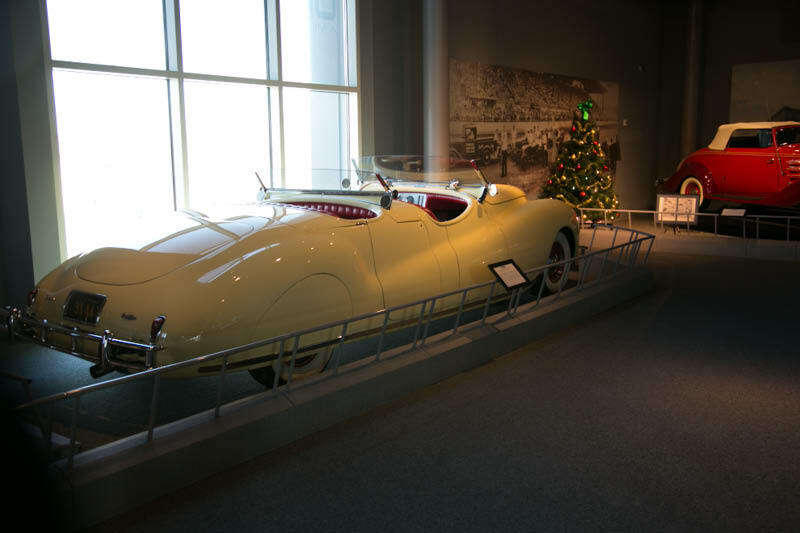 The longest car on display, the Newport sits by the gallery's window, but is only partially visible from outside. One of five made, it features hideaway headlights and a separate rear passenger compartment, complete with its own windscreen. It's the first American car to feature a fender line that flowed from the front to the rear and is one of the first totally unibody vehicles, meaning the frame and body are one structural component. The Hupmobile, produced by the former Detroit Hupp Motor Car Co., is a rumble seat convertible coupe, which means it has a folding rear seat. Streamline characteristics include its curved fenders, canted-back hood louvers and two-toned hood delineating a V-shape. "All of these components make it look like it's flowing with the air, even when it's parked," Gross says. 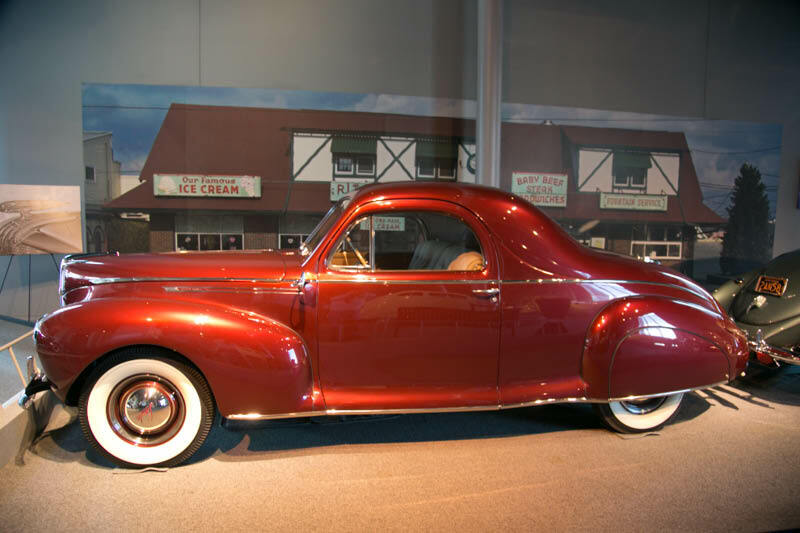 The Zephyr, featuring a V12 engine, was conceived by Edsel Ford as a brand that would bridge the gap between the high-end Lincoln K-series and regular Ford models. It was a personal luxury car built to compete with LaSalle, Cadillac's companion brand. From an engineering standpoint, it is revolutionary because it's the first car that had a cross-flow radiator, which is what modern cars possess. "I'd say out of all the cars, the Zephyr probably has the most beautiful flowing body," Gross says. "The curves are beyond seamless." Most of the vehicles on exhibit are owned by local collectors, Gross says. Allentown Classic Motor Cars, which manages an 80-car collection owned by Nicola Bulgari (a member of the family behind Italian luxury jewelry brand Bulgari), has four cars on display, including a blue 1934 Studebaker Commander Land Cruiser, featuring four windows on its aerodynamic backside. Gross says four factors contributed to the Streamline Moderne movement: the Art Deco designs of the 1920s, which carried over into the cars' ornamentation; Harley Earl, one of General Motors' most famous automobile designers, who spearheaded the company's Art and Color Section in the late 1920s; the 1933-34 World's Fair in Chicago, which showcased Art Deco and Streamline Moderne architecture; and the Great Depression. "You would think the Depression would've hindered the movement, but in contrast, it really helped because all of the manufacturers were looking for ways to bring people into the showrooms," Gross says. "These were so unique and proved to be magnets." 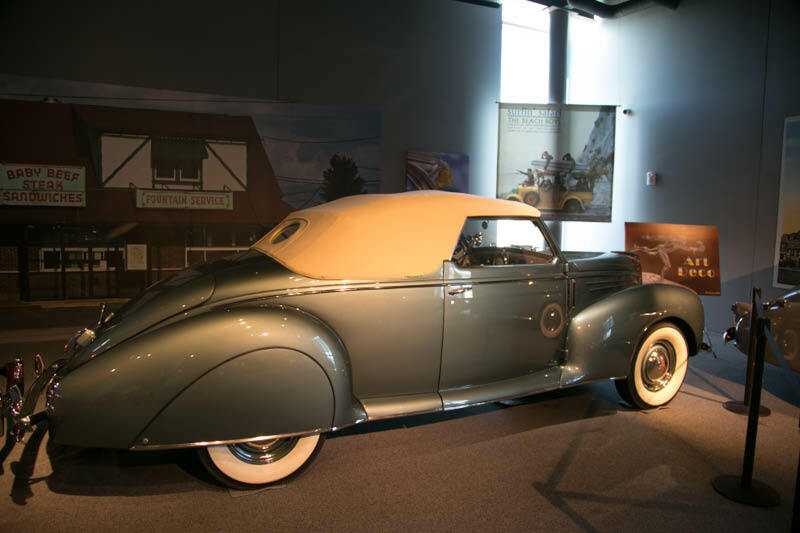 The Streamline Moderne movement fizzled during World War II, when car manufacturers devoted efforts toward the war. Design aspects still exist in cars today, but they aren't as pronounced. "You'll see it in Corvettes and other sports cars that feature more curves and fanciful designs, but nothing quite like these," Gross says. 1939 Graham Model 97 "Sharknose"